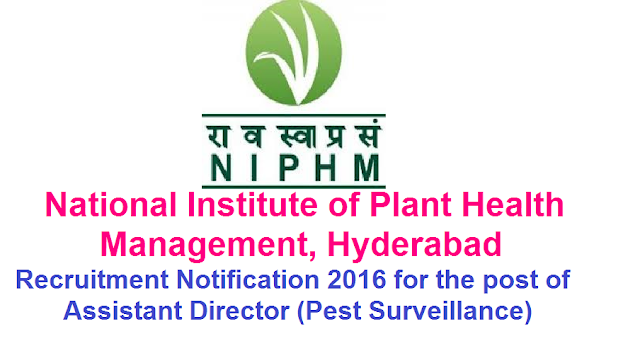 National Institute of Plant Health Management NIPHM, Hyderabad|Ministry of Agriculture & Farmers Welfare Government of India|National Institute of Plant Health Management invites applications for the post of Assistant Director (Pest Surveillance)|The details of educational qualifications, experience, age and other eligibility criteria, duties for appointment on Direct Recruitment / Deputation basis (including relaxations, if any) for the posts of Assistant Director (Pest Surveillance) along with application proforma may be accessed from web http://niphm.gov.in. The details of educational qualifications, experience, age and other eligibility criteria, duties for appointment on Direct Recruitment / Deputation basis (including relaxations, if any) for the posts along with application proforma may be accessed from web http://niphm.gov.in. Minimum work experience of 4 years (2 years for candidates with Ph.D) in Plant Protection work. · Experience in Research, teaching/training in the respective fields will also be considered. 1. Advanced Training in Pest Surveillance. 2. Ph.D. in the relevant subject. iii. Only such persons would be eligible for PwD reservation in services/posts who suffer from not less that 40 percent of relevant disability. A person who wants to avail of benefits of reservation would have to submit a Disability Certificate issued by a Competent Authority. iv. “Relaxation of upper age limit in respect of reserved categories such as SC/ST/OBC/PHE/Ex- servicemen etc., as per GOI orders. (in terms of G.I., Dept. of Per. &Trg., Notfn. No. 15012/6/98- Estt. (D), dated 21st December, 1998.OBC candidates have to enclose latest caste certificate as per GOI norms for claiming age relaxation and for considering to the reserved OBC post. v. In the case of direct recruitment the selected candidates will be governed by the New Pension Scheme, 2004, Govt. of India. 5.30 p.m. Persons working in Govt. service should apply through proper channel only. In case it takes time to obtain clearance from the Head of Department, an advance copy of the application can be sent on or before the closing date. However the application through proper channel should reach NIPHM by the time of scrutiny, else the advance copy will not be considered. viii. Self-attested copies of all educational qualifications along with experience, age relaxation and other certificates are required to be enclosed invariably. Applications without proper enclosures will not be considered for scrutiny. ix. “Age and qualifications can be relaxed in exceptional cases by the Director General”. x. Only candidates willing to take-up residence (throughout their service) within a radius of 3km of NIPHM can apply. xi. Please visit NIPHM website http://niphm.gov.in for the details of duties to be performed and for downloading the prescribed application proforma. xiii. In case of any dispute with regard to screening of the applications, the decision of DG, NIPHM shall be final. xiv. No correspondence will be entertained with the non-shortlisted or non-selected candidates. xv. Canvassing in any form is not accepted and will lead to the disqualification of such candidates. The decision of DG, NIPHM will be final in this regard. 10. Importance of Pest Surveillance in Pest forecasting, predicting pest out break & developing pest management strategies. 11. Success stories of pest surveillance in promotion of gram production in India. 12. E-pest surveillance & basic requirements for E-pest surveillance. 1. ASSISTANT DIRECTOR (PS): As Sub-divisional heads they are expected to plan, implement and coordinate various activities of their sub-divisions to enable the Joint Directors / Directors accomplish the responsibilities assigned. Any other duties assigned by the Joint Directors, Directors or the Director General from time to time.